Anyway, this is by far the MOST SIMPLE dessert to bring anywhere you are going…Even if you are going straight to the couch with a giant serving spoon and the remote control. Don’t judge. I promise… you may be thinking “uh, it’s sub-zero outside… who the heck wants something nice and light for dessert? Bring on the dark chocolate and caramel lady…it’s still winter you diet-pushing-devil,” you’ll just have to trust me on this. 1 Pint Whipping Cream. Please do not cave and buy prepared whipped cream (think yuck) – takes 2 seconds to make your own and makes ALL the difference in taste! Cut the pound cakes into 1/2″ slices and layout on cookie sheet. Bring 1/2 Cup of water, juice of 2 lemons and sugar to a boil. Remove from heat. Brush the lemon mixture on the top of each slice of pound cake. 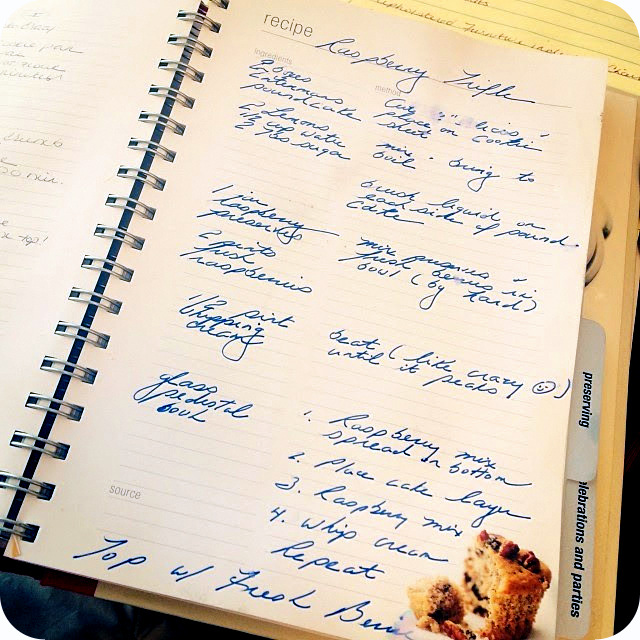 Mix the preserves and fresh berries in a bowl (by hand) mashing up the berries. Place pint of whipping cream, a splash of vanilla (optional) and a pinch of sugar (optional) in a cold bowl and beat on high speed until it peaks. Time for Assembly -and i promise, this is MUCH more easy than assembling anything from Ikea. Start with a layer of berry jam on the bottom. Next, top with one layer of pound cake slices. Next, top with one layer of whipped cream… yes, the HOMEMADE whipped cream you made (YAH!). Repeat until you reach the top of your serving bowl…. Top with some fresh raspberries in whichever design you like. Dust with a little confectioners sugar right before you serve… i swear by this stuff… makes everything look way more fancy than it is. Please do not [as in, I’M SERIOUS, DON’T] substitute strawberries for raspberries. As you know, strawberries have a high juice content. Especially when mixed with sugar, strawberries macerate (meaning they break down and soften releasing much of their juice first). 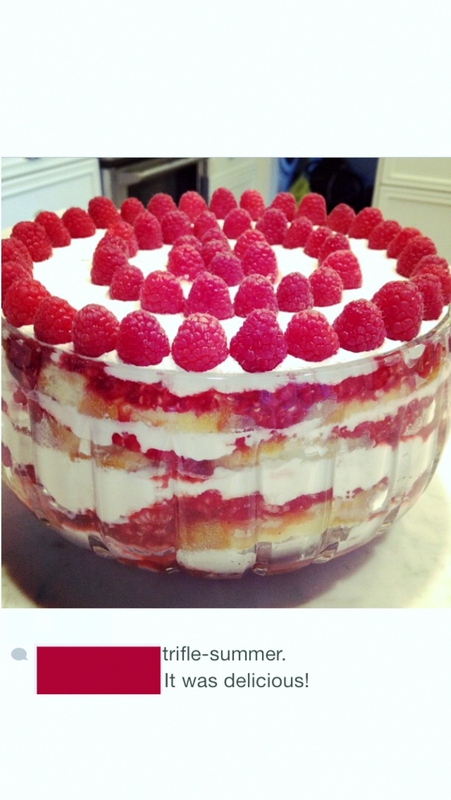 Unless you are headed to your event with some way of convincing people that your berry trifle SOUP is yummy, stick with the raspberries and keep it a solid trifle. The perfect thing about this dessert is that… it doesn’t need to be perfect. Layer however you please… decorate however you please…serve it anytime of the year. How often does someone tell you that imperfection is going to be perfect!